As some people may remember, I featured a (then) 'up and coming' amazing designer called Charlotte Taylor, back in the spring. With the next fashion week just around the corner (and how I wish I was going! ), where she is due to show as part of Vauxhall Fashion Scout's 'Ones to watch' scheme, I thought I'd share a little styling collaboration I recently did with one of her amazing scarves. For the first outfit I'm wearing my favourite pair of Tommy Hilfiger jeans (charity shopped by my mum, and 'appropriated' by me) with the bottoms turned up to ankle grazing length, plus a thrifted DKNY top. Ontop I added charity shopped silk Laura Ashley shirt dress (worn as a coat) cinched in with my favourite vintage belt from my grandma. The scarf is worn as.. dun dun daaaah... a scarf! The second ensemble, with the penguin print as headscarf, is made up of a vintage jumper I bought from a stall at the Big Chill, vintage sunglasses that belonged to my grandma and faux pearls from a vintage fair. 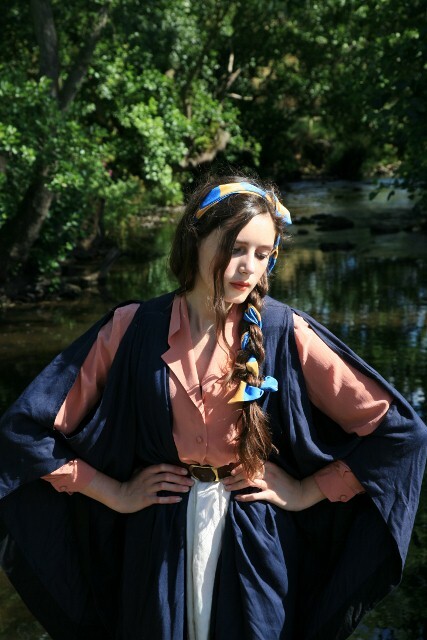 The third look I styled with a blue University gown I also bought at the Big Chill (I love how it looks like a very voluminous cape! Not to be worn by the faint hearted..), a dusky pink charity shopped silk skirt, silk knickerbocker 'shorts' inherited from my great-grandma, a thrifted belt and my 'photographer shoes' from that very wonderful place, A Charity Shop. I plaited the scarf into my hair - something I want to experiment with again. The fourth was put with a vintage suede t-shirt that used to belong to my paternal grandma. The way I did my hair used the same method as in 'Dressed up for Den Making' - I find it quite surprising that all the techniques magazines give for beehives/ high buns are very time intensive and laborious. My way takes me six or seven minutes, tops! 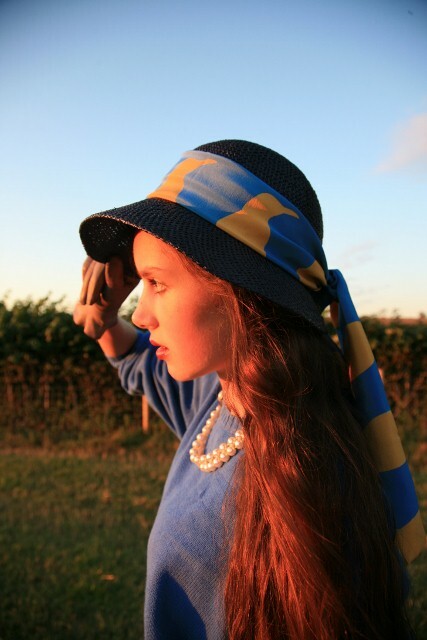 The fifth and final outfit sees the scarf tied around a vintage hat I inherited from my great grandma, with additions of a charity shopped blue wool jumper, vintage leather gloves and faux pearls. Some photos were taken by my mum, and others by my dad at different points in the day. Can you guess who took which? I've just been looking through the latest posts on Jill's blog, and wishing I could have made it to 'Fashion Night Out' yesterday! It looked like such a great event.. I hope that everyone who did go along enjoyed it. I'd love to hear some views on what it was like. and rediscovered the wonderful childhood classic 'The Railway Children' which I used to adore when I was little! Next on the list of films I want to/ must see is 'An Education'. Does anyone have any other suggestions? That scarf is brilliant! I adore the second photo, you are totally gorgeous. You must see 'an education', it's an excellent film! Sadly I can't recomment any more...cinema funds are running very low. 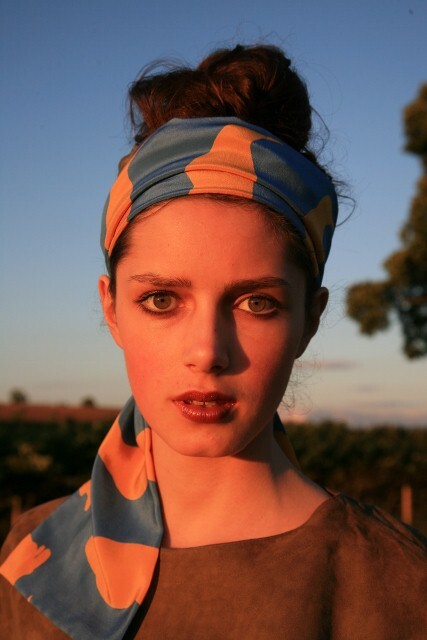 My favourite look with the scarf is the first one. Though I also like it plaited into the hair. It's amazing how much a scarf changes an outfit. I love them for their versatility. I loved Bright Star. It's become my favourite along side The Notebook. you are gorgeous. WHY aren't you modeling for teen-vogue??!! I adore the first outfit, you're so skilled ! OH wow... I love the coat in the first pic. I'm in love with the first shot! Your pose and everything you wear and how you wear it! Love the scarf and especially the third picture! I also adore the gown/cape! The railway children was one of my absolute favourite films when I was little, I must watch it again soon! Some really lovely photos,really really nice qality.Also lovely lighting at different times in the day,I love the way the sky changes. If you haven't already,Amelie is a must see.I also liked coco avant chanel,and chocolat.Just some nice films I remembered off the top of my head. An Education is very good.Great period film,with an interesting plot. I love the way you've made the scarf part of the plait- very clever! I love these hats they are amazing! How do you have so many amazing clothes?! I would recommend watching the Notebook- it makes me cry everytime I watch it! Did you know that that the Railway Children is on at Waterloo Station in London and it features a real steamtrain?! I've seen it and it is a great adaptation, really worth seeing. Gorgeous, gorgeous! 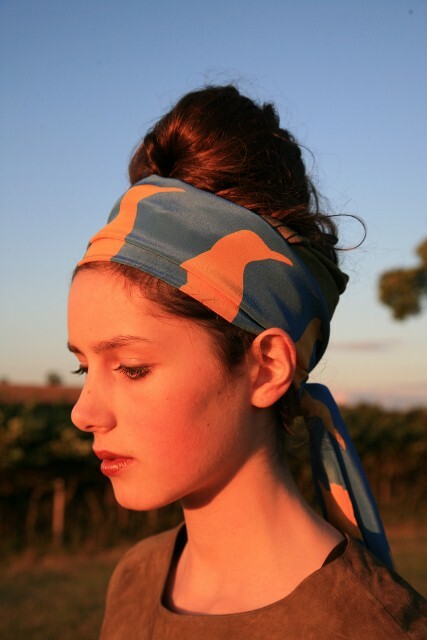 My favourite styling of the scarf is perhaps when it's interwoven with the plait, though i adore the classic pose of the first picture and where it's simply wrapped around a bun. I must say the golden light in those pictures is actually beautiful, it also suits the warm colours of the scarf as well (yay penguinss :)). I can't believe i haven't heard of Charlotte Taylor, any designer that can use a penguin motif in a sophisticated fashion deserves a big thumbs up:D.I've noticed u seem to be building up a repetior of vintage hats! i've just seen Bright Star, absolutely loved it(sooo beautiful), and Nowhere Boy was just brilliant-esp Kristin Scott Thomas as Mimi. i can't wait to see 'Black Swan', and 'Never Let Me Go' which also has Carey Mulligan in i think. The first photo is my absolute favorite! I love your outfit and you look beautiful! I have just realised that I have never seen you do a photo shoot which doesn't have a background of stunning scenery! The sun always makes scenes look so much more beautiful I think. Your clothes are put together in such an effortless fashion that you never look like you are trying too hard. Perfect. An Education is quite possibly the best film I have ever seen. Carey Mulligan does brilliantly, and the 60s clothes are amazing - my favourite a white dress Mulligan wears whilst at a jazz club. Enjoy! What a great movie list, I haven't seen an education, but I'm planning to watch it some of these days,great pictures by the way. The Photographs are Beautiful. You, look Wonderful. beauitful dear! i love the colours of your outfit and the lighting in these photos. so pretty! Also, congrats on the Who What Wear September Style Stalker feauture:):) Well deserved! amazing cape? Talk about creative thinking! I'm constantly amazed at how any old item can catch your attention and get you thinking about how it can be worn. Yeah, it's definitely my favorite look of the bunch. The navy blue looks so perfect with that shade of pink. And the idea of weaving the scarf with your braid is brilliant...I tried recreating the look and failed miserably, hehe.. Oh yeah, and I will reiterate that An Education is a stunning film. seen it already, but Into the Wild is one of my favorites. Have you seen Polanski's Ghost Writer? Copyright images and text 2019 Rosalind Jana. All rights reserved. All content is copyrighted to Rosalind Jana, unless otherwise stated. Do not reproduce the images or text without proper credit and/or permission. © Rosalind Jana | All rights reserved.